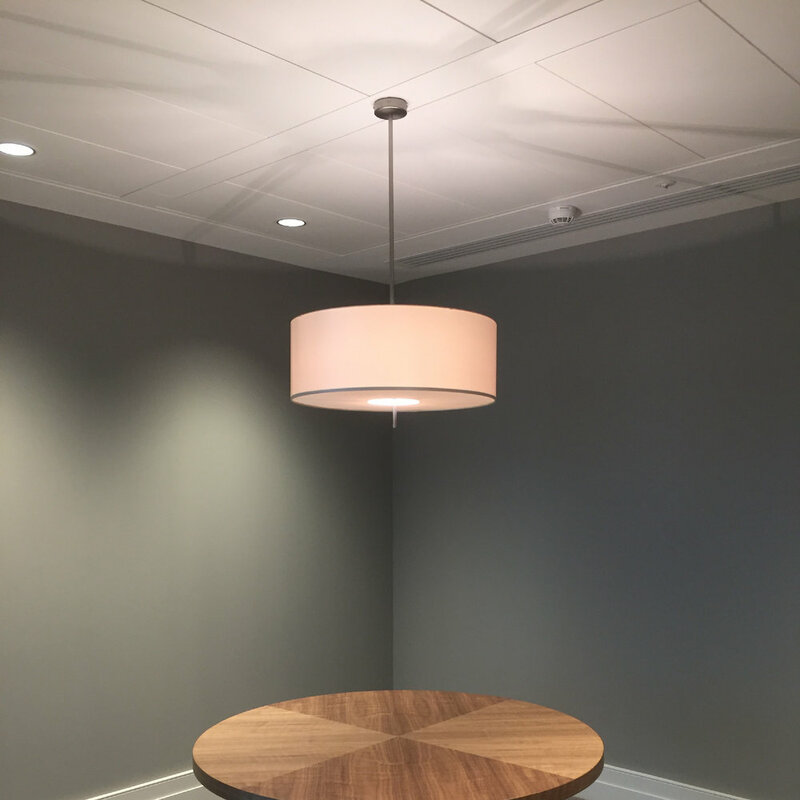 Scope of works: Drywall partitions and bespoke curved partitions, SAS metal ceilings, plasterboard ceilings and bulkheads, firestopping, timber door sets and skirting boards. Rathbones was quite a high spec office fit out across four floors at Finsbury Circus, London. On the lower three floors, we kept the original SAS 130 system suspended ceiling, just removing enough of the ceiling to allow us to build the new full height partition walls for the new offices. These drywall partitions were created using British Gypsum GypWall Classic system on three sides with a glazed screen and door to the front side of the office. Within these individual offices, we installed a small SAS 130 system suspended ceiling with a tape and joint finished MF plasterboard margin around it. Then, we built the existing office space ceiling back into the new office partitions again. We used an SAS TCA 0124 shadowgap trim around the exterior walls of the new offices. The trim was suspended from the soffit rather than fixed into the partition walls. This process was to allow for deflection of the floor/soffit, so the walls would be able to move up and down independently of the ceiling while reducing any cracking or level changes in the ceiling. The eighth floor was notably different to the lower three floors. This floor was for the Directors' offices and meeting rooms. Due to this, the eighth floor was a higher spec and required a high acoustic value. All existing suspended ceilings and partition walls were stripped out and replaced throughout. The whole floor was partitioned off into various offices and meeting rooms. For this, we used British Gypsum Soundbloc plasterboard, mineral wool insulation and acoustic studs. The high dB rating, required in these rooms, was achieved by the products we used. Deflection was an issue on this project as there were large floors that, a survey had shown, were liable to deflect considerably. We overcame this problem by using extra deep head track on all drywall partitions and by cutting the studs within the track short enough to allow the desired deflection zone within the wall. This would help the wall to move up and down with the floor/soffit as it deflects, thus reducing any cracking of the wall due to movement. We also built some curved partition walls in the corridors — one of which was quite a challenge as it was rather acute at 60 degrees. The suspended ceilings on the eighth floor were predominantly MF plasterboard ceilings in the corridors with a skim coat plaster to these and also to the corridor walls. 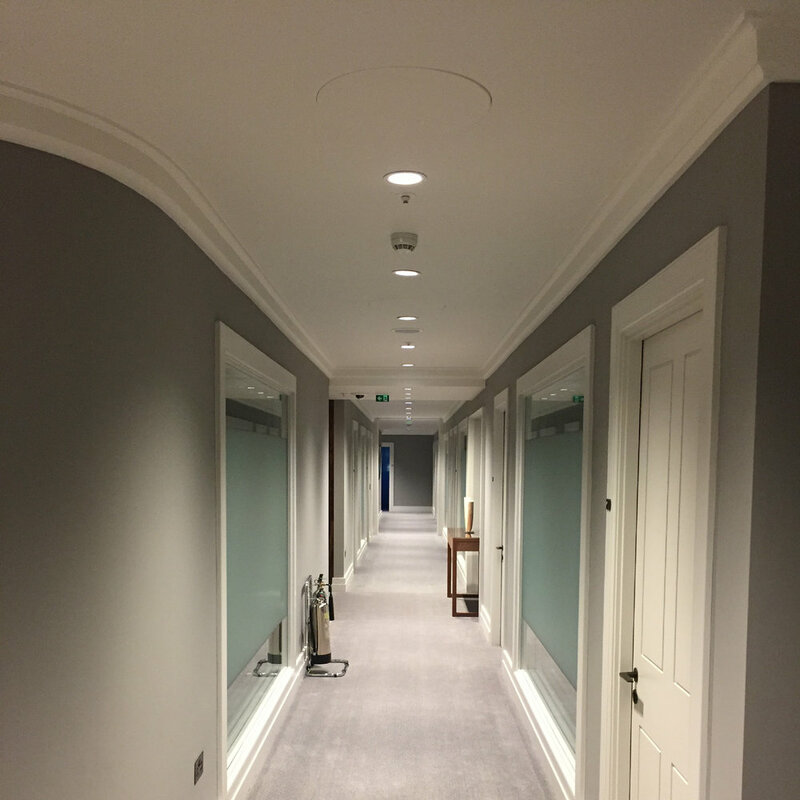 Not so easy to plaster the curved corridor walls, but an excellent finish was achieved. In the meeting rooms and offices, we installed SAS system 330 metal ceilings, some rooms in white RAL colour 9010 and some, particularly the reception area, in a light grey RAL colour 7047. These metal SAS ceilings were surrounded by MF plasterboard margins with a tape and joint finish. The SAS metal tile ceilings in the reception were at a slightly higher level than the surrounding plasterboard. This allowed us to build a plasterboard upstand surrounding it, where some lights were hidden, to shine up onto the metal ceiling. The final effect had a distinctive premium feel. On this project, we also were awarded the timber door set and joinery package. The doors, some 58 in number, had a very high dB acoustic rating, many of which were 45dB. The architraves and skirtings, of which there were approximately 3000lm, had matching mouldings, so, where they joined, we cut a "masons mitre" joint which gave a good finish. To install this skirting board around the curved walls, we fixed 6mm MDF skirting around the curve and built it up layer by layer until we had the desired thickness. In the corridors, there were three sets of pocket doors on pivot hinges. When in an open position they recessed into pockets within the wall that we had created. 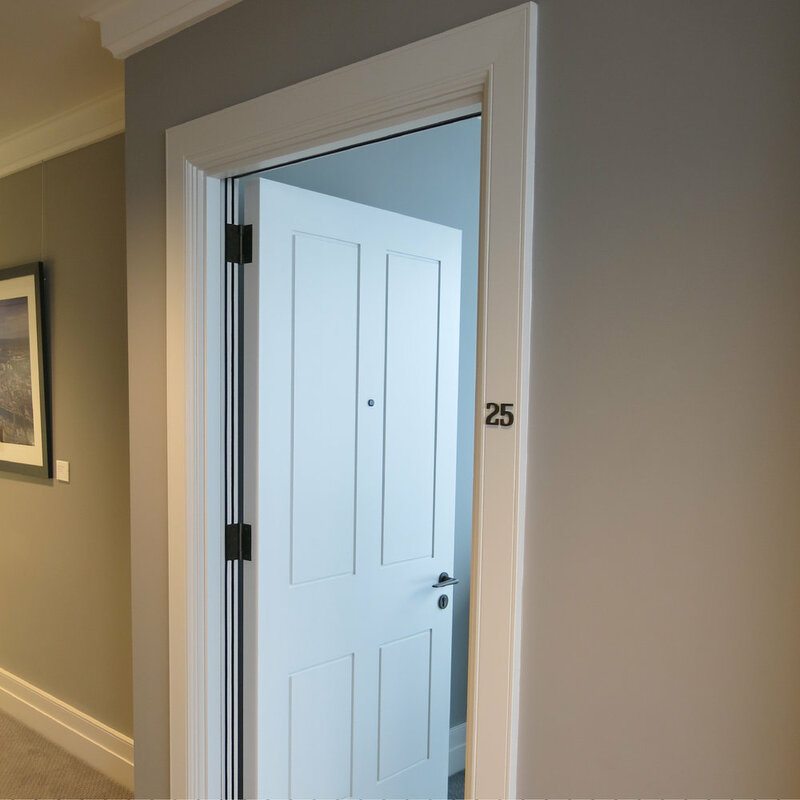 All the doors on the eighth floor had bronze door furniture which ultimately enhanced the look of the spaces to one of superior quality. Timber-framed glazed screens were also built to bring natural light into the corridors. Once complete, this project was outstanding and had a definite feel of quality about it. We are proud to say that AD Contracts played a huge part in delivering that high-end finish, required by the client.